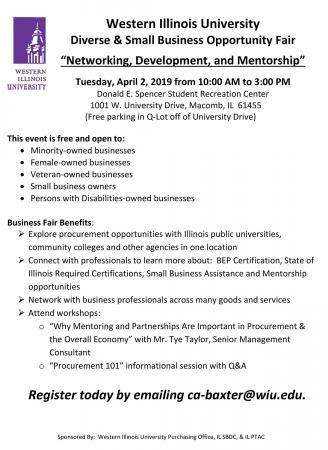 MACOMB, IL – The Western Illinois University Purchasing Office, the Illinois Small Business Development Center (IL-SBDC) and the Illinois Procurement Technical Assistance Center (IL-PTAC) will host a Diverse and Small Business Opportunity Fair from 10 a.m.-3 p.m. Tuesday, April 2 in the Donald Spencer Student Recreation Center on the Macomb campus. The theme of the event is "Networking, Development and Mentorship." The event is open free to minority-owned businesses, female-owned businesses, veteran-owned businesses, small business owners and persons with disabilities-owned businesses. • Explore procurement opportunities with Illinois public universities, community colleges and other agencies in one location. • Connect with professionals to learn more about BEP certification, state of Illinois required certifications, small business assistance and mentorship opportunities. • Network with business professionals across many goods and services. To register for the fair, email CA-Baxter@wiu.edu.